Marin County's top fire official says a downed PG&E power line sparked a wildfire that burned more than 150 acres and threatened dozens of homes near the community of Lagunitas. 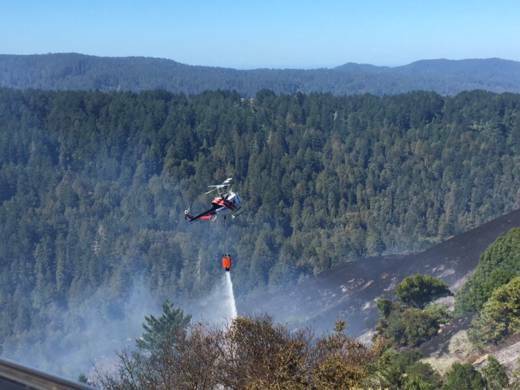 "The investigators determined the cause to be a power line that came down into the grass," Marin County Fire Chief Jason Weber said in an interview Wednesday. The power line that ignited the Irving Fire was located on Barnabe Mountain in Samuel P. Taylor State Park, Weber said. There was a PG&E power outage affecting customers on Arroyo Road and Portola Avenue at the time the fire started Monday evening. Weber said the outage is believed to have cut power to a county fire lookout and several communication towers on Barnabe Peak. "I don't know if there was a connection between the two. I would certainly suspect there was," Weber said, adding that he would not release any more details about the fire probe. Karly Hernandez, a PG&E spokeswoman, noted that the county's investigation was not complete and declined to answer questions about the cause of the blaze. Cal Fire investigations of last October's catastrophic North Bay fires have found that PG&E power lines were involved in starting nearly all of them. Weber's comments came a day after county officials lifted all of the evacuation orders associated with the fire. The Irving Fire was 65 percent contained as of Wednesday morning. Weber said he expected the fire to be fully contained in the next two days and that fire crews would stay on scene at least until Thursday. "I don't expect any additional growth," Weber said. While the fire threatened homes, no structures were damaged or destroyed. No residents or firefighters suffered injuries.